September 2015 | La Petite Noob | A Toronto-Based Fashion and Lifestyle Blog. According to Google, this week is to be Toronto's last week of late summer weather and then we're into the moderate temperatures for Fall. Although I'm sad to see summer go, I'm pretty excited to change up my wardrobe for the season and that starts with breaking out my boots and jackets. Oh how I love boots, specifically pointy-toe heeled booties. I don't find myself reaching for heels in the summer too often, but as soon as you slap a heel on a boot then I'm all over it - weird, right? Pairing my favourite fall booties with a military jacket and a leopard scarf makes me excited for Fall. Summer, who? If you need me, I'll be shopping for more boots. One of the questions that I get asked the most is how I manage blogging and freelance content creation, all while working a full-time 9 to 5 job. Although I dream of the day that I would be able to blog full-time, Mama's gotta work - those shoes won't buy themselves! Managing the demands of blogging while working 9-5 isn't easy, and certainly isn't glamorous, but it can be extremely rewarding. Here are some of my best tips and tricks on how I stay focused, inspired and organized while trying to juggle blogging with my full-time job. I'm a morning person on my worst day, but since blogging mornings have become my lifeline to being productive and getting things accomplished. My typical weekday morning consists of getting up at least 2 hours before I need to leave for work, making myself a cup of coffee and answering emails. Staying on top of your emails is essential for avoiding blogger burn-out while working, since nothing triggers anxiety like an inbox full of unanswered messaged. I like to respond to every email I receive, even it's its just a quick 'no thank you' to opportunities that don't interest or apply to me. Mornings are also a great time to review and respond to comments on your blog and social media - similarly I think that every message deserves a response, even if it's just a quick 'thank you.' Even carving out an hour each and every morning to devote to blog-related emails and comments will ensure that you keep on top of your correspondence, and help to establish a reputation for yourself as reliable. Daylight hours are so valuable for blogging, especially as we move into the winter, and if you work a day-job then chances are you'll be stuck at the office during prime photo-taking hours. I like to bite the bullet and take all of my blog photos during the weekend, or whatever day that I have off from work. Always take more photos than you think you need since you won't have an opportunity to re-take them during the week, and may need a few extras for social media. Speaking of social media, I also tend to take a few Instagram photos on the weekends that I will edit and post throughout the week. To avoid burn-out, and to have a chance to relax, I don't actually edit my photos on the weekends - I save that for weeknights. Since I've taken all of my photos on the weekends, I like to devote a few nights a week to editing photos and drafting blog posts to be published the next day. Editing definitely doesn't seem as daunting if you do it a few days after the photos have been taken, and viewing your photos with a fresh pair of eyes gives you a new perspective while you edit. Breaking up the components of a blog post over a few days is great for avoiding burnout and keeps your mind creative. I'm a pen-to-paper kind of girl, and nothing keeps me organized while trying to balance full-time work and blogging than planning out my posts for the month, and writing all of my commitments down. I actually have two separate planning systems, one for work and one for blogging - I find that this helps to keep me focused and prevents me from becoming overwhelmed. I recommend using a planner that not only allows you to plan by the day, but also has a month at a glance so that I can jot in any deadlines and events and can make sure that I'm not overcommitting. Blogger burnout is real, and I suspect that it has a lot to do with accepting each and every offer and event invitation that comes your way. When I first started blogging,I would happily accept all requests for collaborations that come into my inbox and while it's a great way to learn how to work with companies and brands, it's simply not sustainable over the long run - especially when you have a full-time commitment during the day! It's totally okay to be selective about which blogging projects you take on, and events you attend. Being selective actually helps keep your creative side vibrant; you still want to feel in control, and this may be compromised if you accept too many projects and commitments while still having to work full-time. Admittedly, sometimes it's hard to see the bigger picture as to why you continue to push yourself and blog while working full-time: wouldn't it just be easier to just commit to one? Financial issues aside, I actually think that working full-time gives you a new skill set unique to you and actually helps with blogging. For example, I write a lot of business correspondence at my day-job which actually helps me to ensure each and every email related to my blog is articulate and professional. Do you work with people at your day job? You will have a leg-up when attending events and meeting new bloggers since chances are you'll be relaxed and experienced in talking to everyone. Blogging itself is a great way to stay creative, and creativity is a wonderful skill that lends itself useful to all jobs. 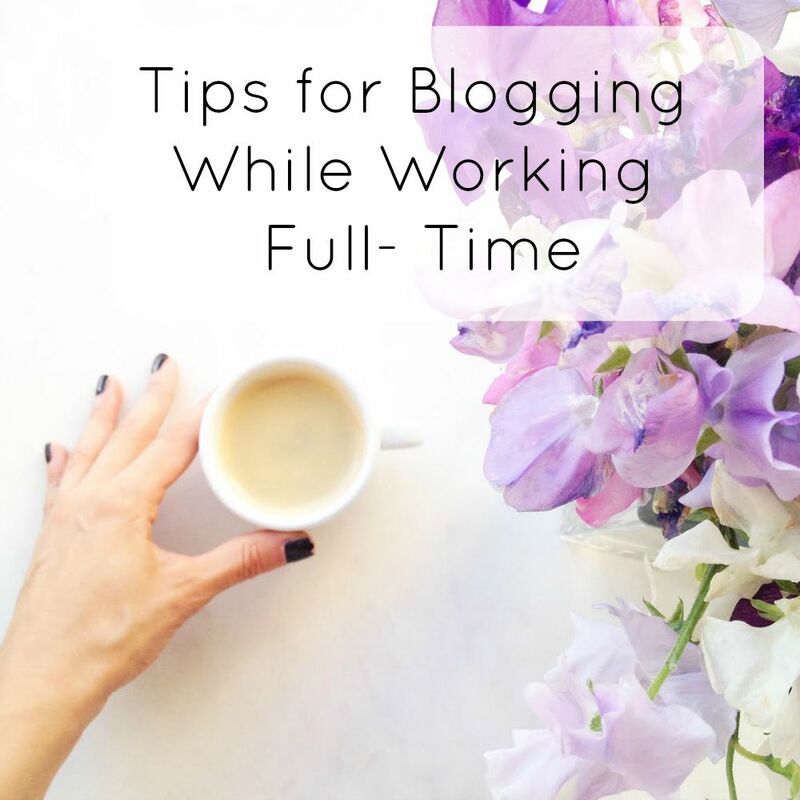 Blogging while working full time is definitely a challenge, and will really test your time management skills - but is completely worth it! Do you work full-time while blogging? What are some of your biggest tips for managing both commitments? I think that this is an issue that most of us face, so I would love to hear your thoughts - join the discussion! I always said that it takes a confident girl to walk around town in a wide brimmed hat. Something about wearing a hat draws stares and looks that admittedly takes some time to get used to, but I got over it. Wear a pair of thigh high boots around town, and a hat is the least of your worries. Touted as one of Fall 2015's must-have items, over-the-knee boots have been on my wish list for some time and when I saw this perfect pair from Zara I had to have them. Sure they garner a few raised eyebrows, but there is absolutely nothing you can wear that is more empowering than thigh high boots. Paired with a simple long-sleeved shift dress and my signature hat, I couldn't tell if the boots made me want to strut like the world was my runway or kick some tush like it was my battlefield. Whatever the situation, over the knee boots are officially my new obsession and I'm really looking forward to having them transition my wardrobe into the colder months. "I want a girl with a short skirt and a long jacket." Do you remember that song by the band Cake? As a child of the 90s, I'm always up for a little nostalgia and what better way to celebrate the alternative rock of your youth than by wearing an outfit that's the subject of a song. Wearing shorter dresses with longer pieces on top has been a staple of mine all summer, but this incredible floor-length duster jacket is taking things to another level. Both the dress and the jacket are from a company called Third Phase Clothing, and I had the pleasure of meeting with the founders at my hotel in Los Angeles while vacationing in California. What struck me most about this company is that each of their pieces is intermixable with the next and they actually show you how to style each item three ways - what a great concept, especially for someone who loves to mix and match their wardrobe like me. Song title or not, from Los Angeles to Toronto, the short dress and long jacket has become a new favourite and I'm looking forward to taking it through Fall. 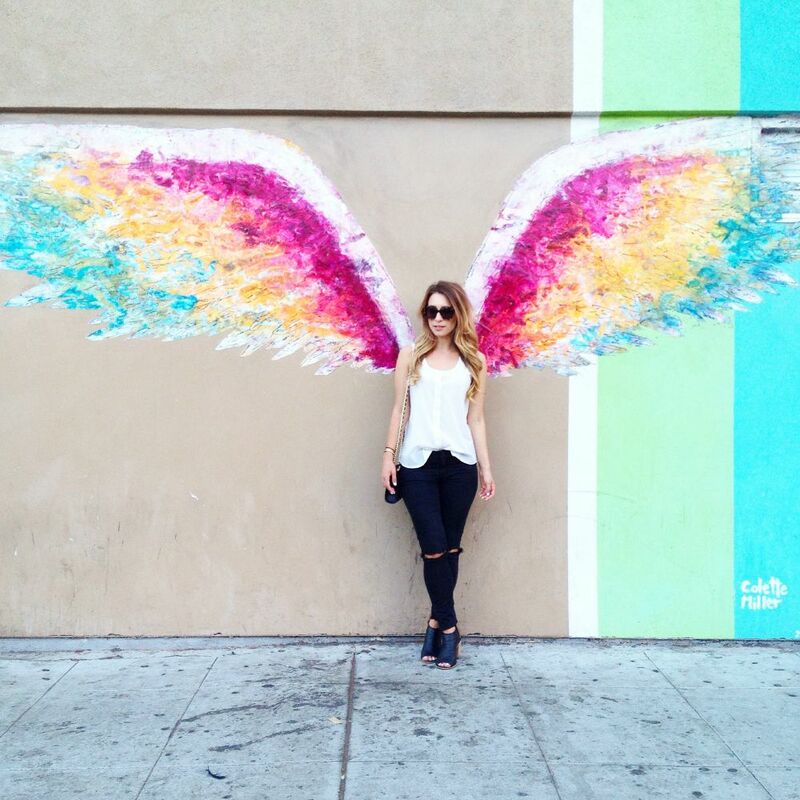 'Giant Pink Wall' I screamed as Brian and I were cruising down Melrose Avenue during a recent trip to California. The answer to every cutesy blogger's dream, a giant pink wall is our kryptonite and as soon as I spotted this rose masterpiece it was everything I could do not to jump out of the moving vehicle and run over to it and strike a pose. This outfit is typical of my Californian style - easy pieces that you can pack into a single carry on luggage for two weeks of travel. Shift dresses are such an easy travel piece and this grey number from Aritzia is no exception. Typically I opt for large brimmed hats while traveling but due to the brutal heatwave LA was experiencing on our visit, a silk scarf was a much cooler option. Notice the wedge heels? Not your typical Petite Noob style, but I was wearing my bathing suit under this number for an afternoon pool party and nothing makes a girl feel better than a pair of sky high heels with your bikini. Hey when in West Hollywood, right? After spending the past week in Los Angeles, I can officially say that my heart has been stolen by la la land. Southern California was hit by a massive heat wave during our stay, so my wardrobe choices for the second lag of the trip are very different from the first. 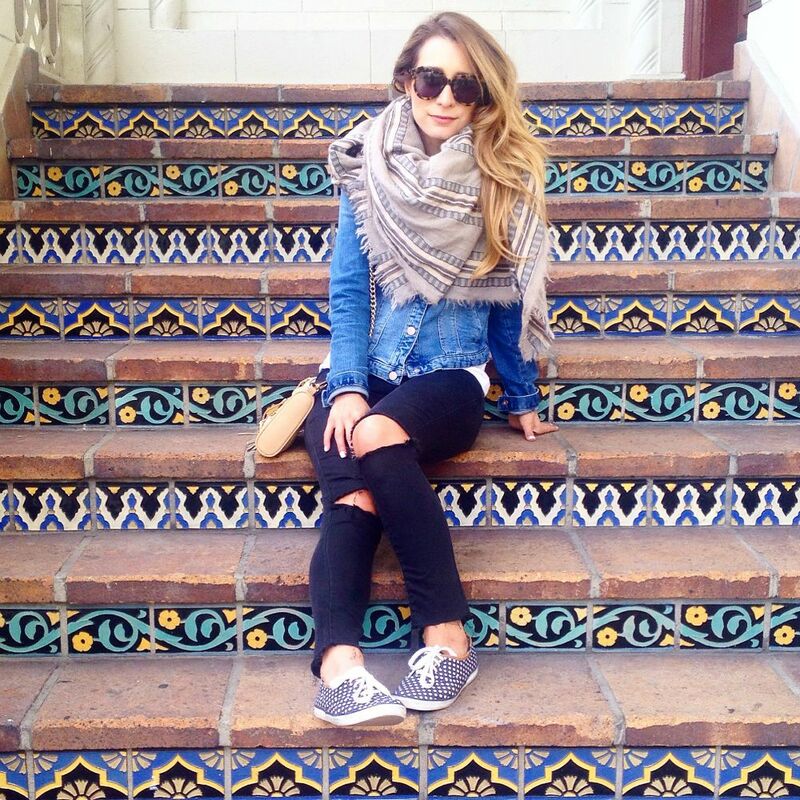 Check out what I wore in LA as per my Instagram - looking forward to giving a recap of this amazing trip upon my return. If you follow me on Instagram or Snap Chat (lapetitenoob), you know that I've been spending the last week and a half galavanting through California. The sunny state of Cali has completely stolen my heart, and I can't wait to share our adventures as we road tripped from San Francisco to Los Angeles. In the meantime, check out my outfits from our first lag of our trip - San Francisco, Napa Valley and Carmel By The Sea. The weather in Northern California is pretty temperamental; breezy and cool for the most part but with bursts of heat so layering is a must - no easy feat when you use just a carry on luggage! Check out what I've been wearing.